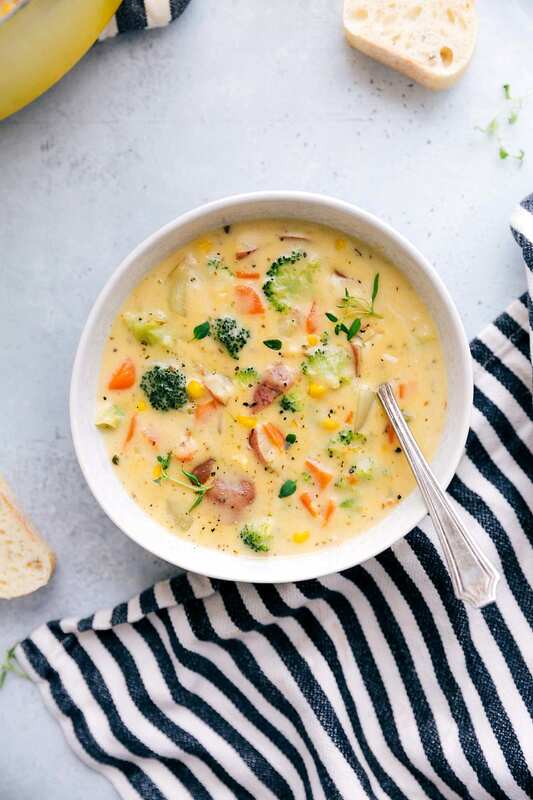 A delicious and easy-to-make creamy vegetable soup packed with veggies and healthy ingredients. Serve this creamy vegetable soup with this pear salad, these roasted brussel sprouts, or a crusty loaf of bread! I’m so excited to be partnering up with Kroger this year to bring you delicious recipes and great content! This post is brought to you in partnership with Kroger, as always, all opinions are my own. This past year I’ve had the opportunity to participate in Kroger’s Zero Hunger | Zero Waste initiative. Participating in this initiative has been so meaningful and eye-opening for me. Approximately 1 in 8 Americans struggle with hunger, yet 40% of the food that is produced in the U.S. goes to waste. Kroger’s #ZeroHungerZeroWaste initiative is working to combat these startling statistics by partnering with local communities to get food to those who need it most. Since 2013, Kroger has donated over 1 billion meals to those in need, and aims to donate 3 billion meals by 2025. Being involved in #ZeroHungerZeroWaste has been so important to me and my family. This Holiday season, I want to invite you to get involved as well! 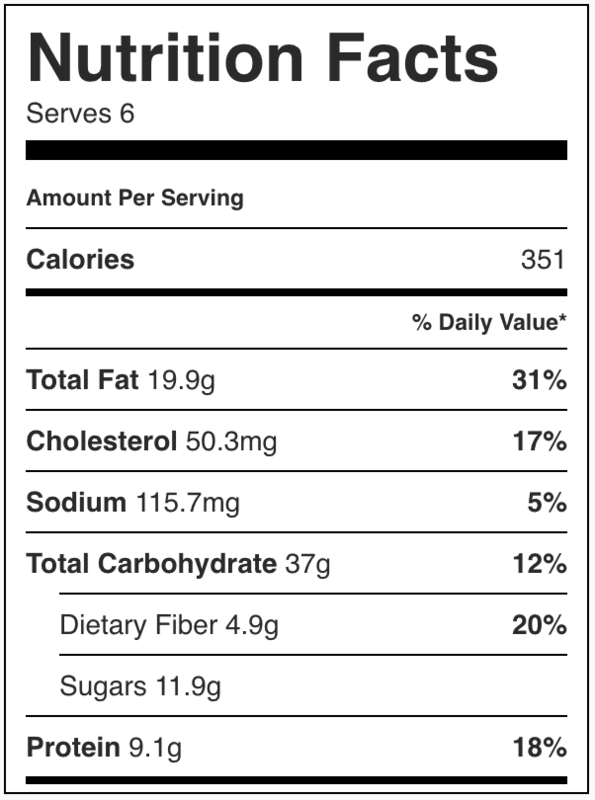 Those who struggle with hunger also struggle to get healthy, balanced meals. To help satisfy not only hunger but satisfy nutritional needs as well, consider putting together a meal package. 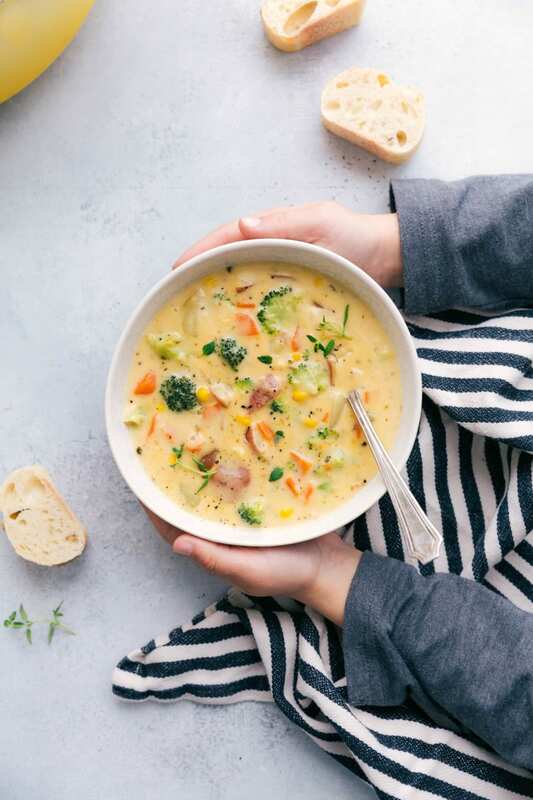 Find a recipe (such as this creamy vegetable soup or this cheesy broccoli and rice dish) that uses healthy, shelf-stable ingredients, print off the recipe card, and head to your local store to purchase the required ingredients. Put the ingredients together with the recipe card, and voila! You’ve just helped provide a family with a healthy, balanced meal. 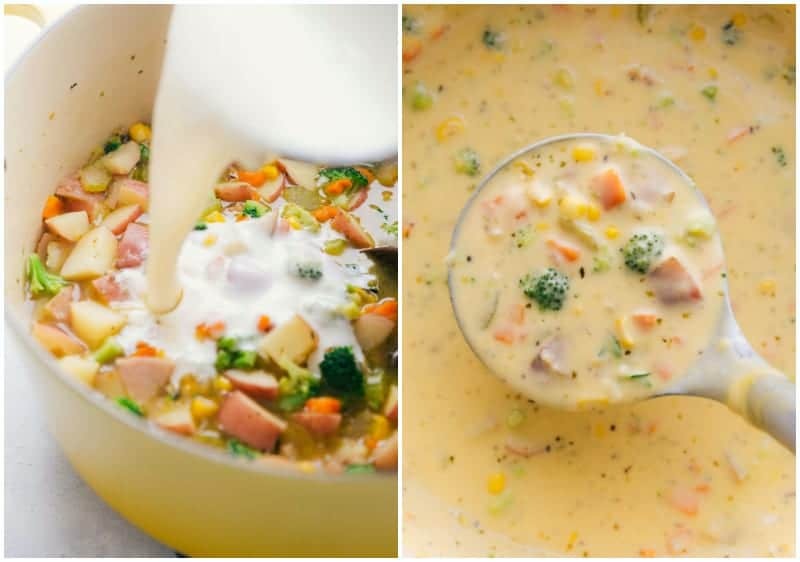 To make this creamy vegetable soup recipe shelf stable, replace the butter with vegetable oil, the frozen and fresh veggies with canned veggies, and the milk and cream with evaporated milk. Kroger’s #ZeroHungerZeroWaste initiative relies on the local communities to get the food to those who need it most. Find your local food banks and shelters and volunteer in any way you can. Invite others to participate in the #ZeroHungerZeroWaste initiative! 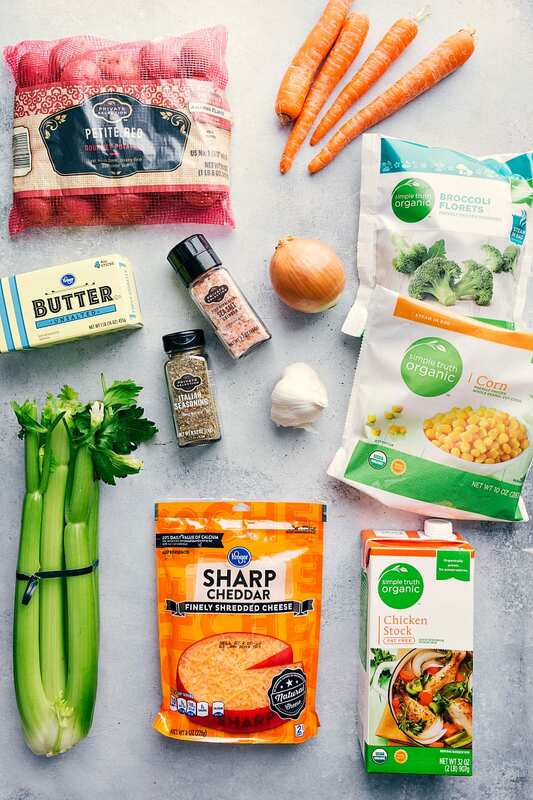 Kroger is not only working to eliminate food waste and hunger, they are simultaneously working to improve health by providing healthy, quality food. I love their Simple Truth Organic brand because it is organic, non-GMO, and AFFORDABLE! Kroger’s Simple Truth Organic foods often cost the same amount as their non-organic counterparts, but are better for you and full of flavor! 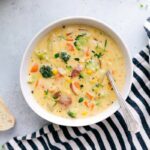 This creamy vegetable soup includes some of my favorite Simple Truth Organic products: chicken stock and frozen vegetables. Honestly, Simple Truth Organic frozen vegetables are the highest quality and best frozen vegetables I’ve ever tried. 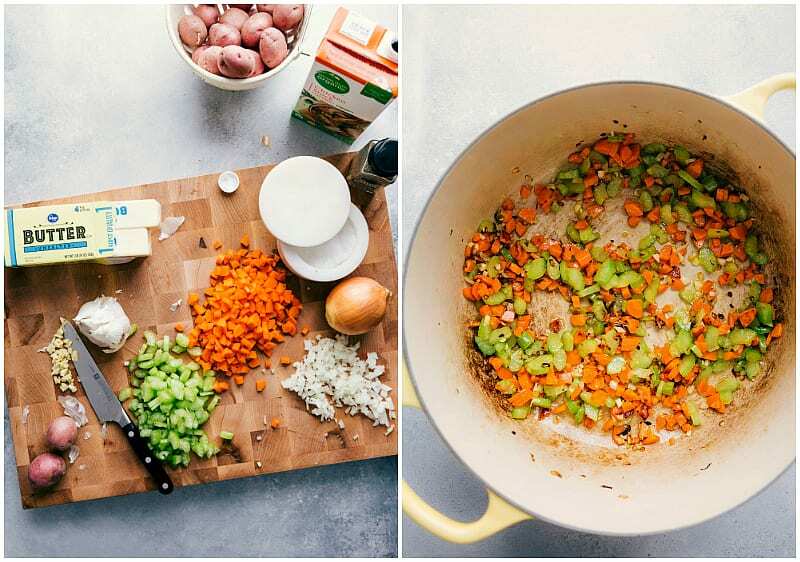 How do you make creamy vegetable soup? Prepare the vegetables by sautéing the carrots, celery, and onion in butter and oil. 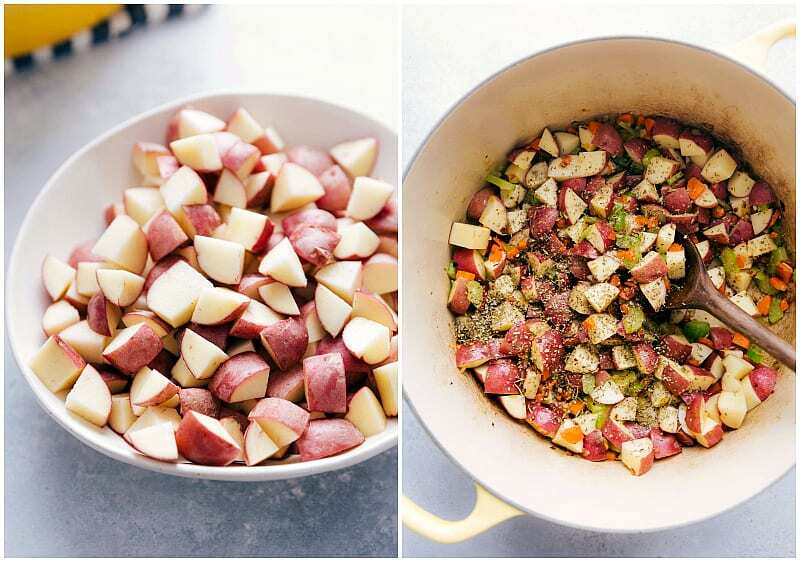 Stir in the chopped Private Selection potatoes, Italian seasoning, and Simple Truth Organic chicken stock. Bring to a boil and cook for 15-20 minutes. While the veggies are cooking, prepare the cream mixture by melting the remaining butter, stirring in the flour, milk, and cream. Once veggies are tender, stir in the Simple Truth Organic broccoli and corn and cook for 2-3 additional minutes, or until the broccoli and corn are warmed through. Remove the vegetable mixture from heat and add in the cream mixture. Season to taste, top with Kroger’s Sharp Cheddar shredded cheese and enjoy warm! Although this is an easy meal to prepare, you may be looking to simplify this recipe a bit further, especially if you are trying to make this meal something you could donate to your local food shelter. To do this you can simply replace the frozen vegetables with canned vegetables and leave out the milk, butter, cream, and cheese for a non-creamy but still delicious vegetable soup. In this creamy vegetable soup recipe, I have provided my favorite way to make a soup creamy – a good mix of butter, flour, milk and cream. However, there are lots of other ways to make a soup creamy. Read on for alternate solutions. If you are vegan or lactose-intolerant, you can replace the butter with vegetable oil and use almond milk as well as dairy-free cheese. For a gluten intolerance, the flour used can be replaced cornstarch, just use half the amount called for. If you are working to make this meal shelf-stable, replace the milk and cream with evaporated milk. 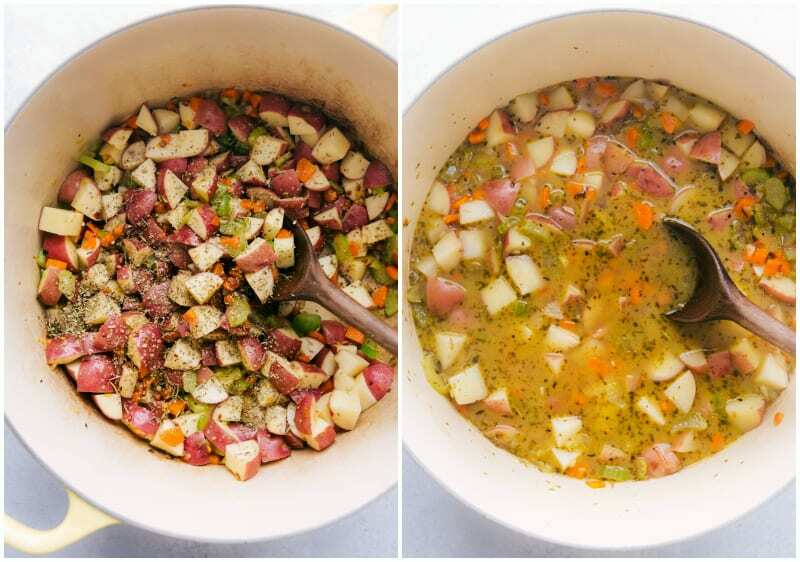 The secret to the great flavor of this soup and most vegetable soups in the stock it is cooked in. I used Kroger’s Simple Truth Organic chicken stock in this recipe and it is delicious! There are a lot of spices you can also add to enhance the flavor of your vegetable soup. What spices are good in vegetable soup? Paprika – if you like a little bit of heat in your soup, you may want to add some paprika (up to 2 teaspoons). Black Pepper – freshly ground black pepper is also a great addition to any vegetable soup. Other fresh herbs such as thyme or basil would also be great in this soup – add according to your personal preferences! In a large pot over medium heat, melt 1 tablespoon of the butter and add 1 tablespoon olive oil. Add the diced carrots, celery and onion and saute 5-7 minutes. Add garlic and saute 30 seconds more. Stir in the chopped potatoes, Italian seasoning, and chicken stock. Bring to a boil over medium-high heat, then reduce heat to medium, cover with lid and cook 15-20 minutes or until the veggies are crisp tender. 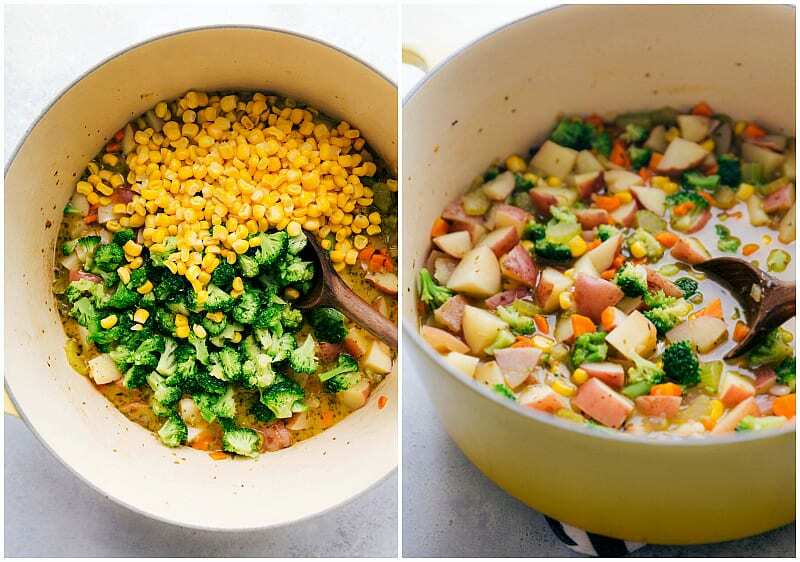 Stir in broccoli and corn and cook 2-3 minutes longer or until veggies are tender and warmed through. Meanwhile, melt remaining 4 tablespoons butter in a medium saucepan over medium heat. Stir in flour and cook, whisking constantly 1 minute. While whisking vigorously, slowly pour in milk (whisk well until smooth). Cook stirring constantly until mixture begins to gently boil and thicken and then stir in the heavy cream. Remove from heat and once all veggies are tender pour the milk/cream mixture into the vegetable soup and stir. Season to taste with salt and pepper. Lower heat to low and stir in the shredded cheese. Cook until cheese is melted. Serve warm with freshly chopped parsley or thyme and bread! Made this tonight, and it is fantastic. I used veggie stock to make it vegetarian, and it was delicious. A keeper, thank you! So happy to hear you enjoyed the soup! 🙂 Thanks for the comment Breeanna!